I’ve moved some posts over but will be adding to it weekly from now on. The best Lao Christmas present you can buy! 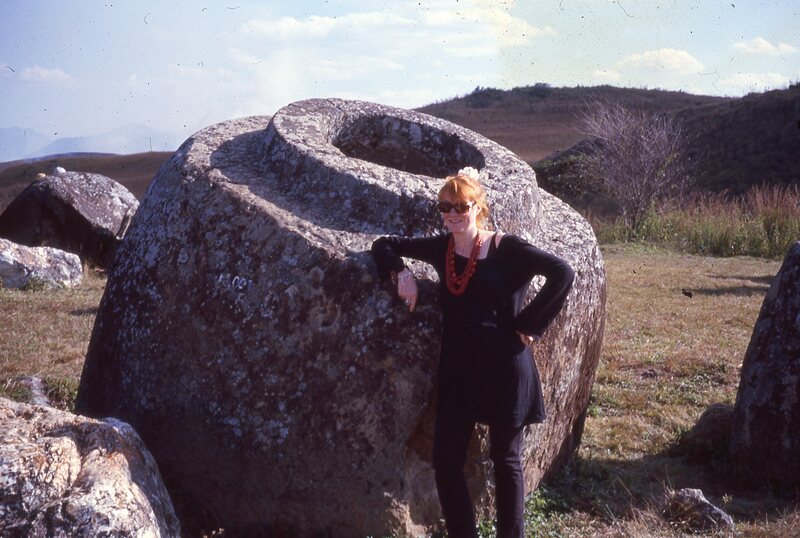 Below I relay the story of how I came to find this treasure and then write a book of my own about it. A few years ago I read a sentence in the ‘Lonely Planet Guide’ stating that there was only one book in print on Lao cuisine written in the English language. For someone, like me that was just too tempting. This was like a food-tourist equivalent of a whodunit: a real treasure hunt. I had to find that book. 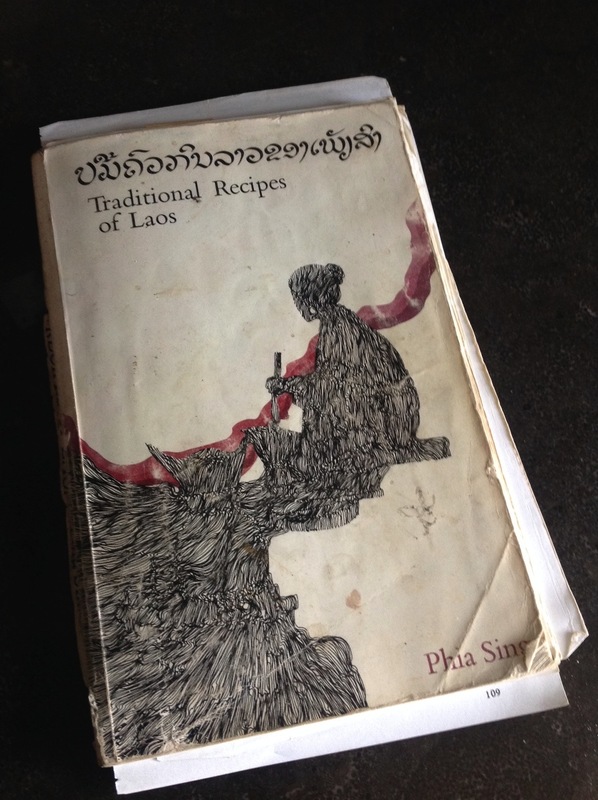 The book prints the recipes in both Lao and English. 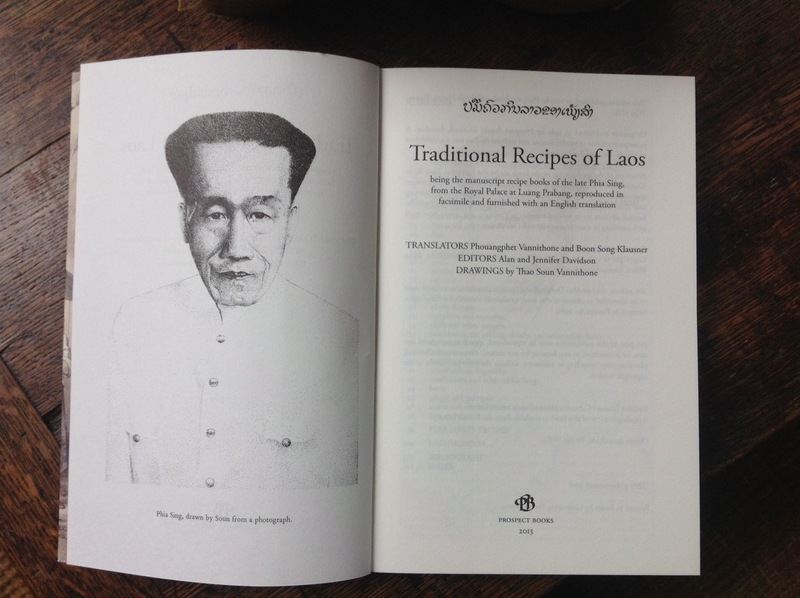 The lone cookbook was called “Traditional Recipes of Laos” and was printed by Prospect Books, a tiny publisher of culinary academia and rare recipes. I placed my order and within a week I had it in my hand. A slim, cream paperback, exquisitely illustrated with delicate pen-and-ink drawings. 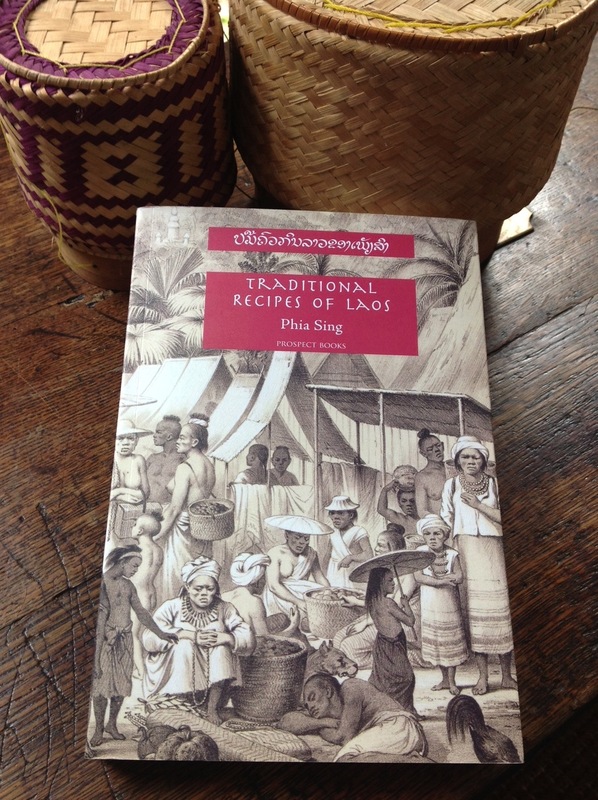 It was a real find, for it contained the recipes of the late king of Laos’s chef, Phia Sing – the recipes of the royal court of Laos! The book was fascinating. 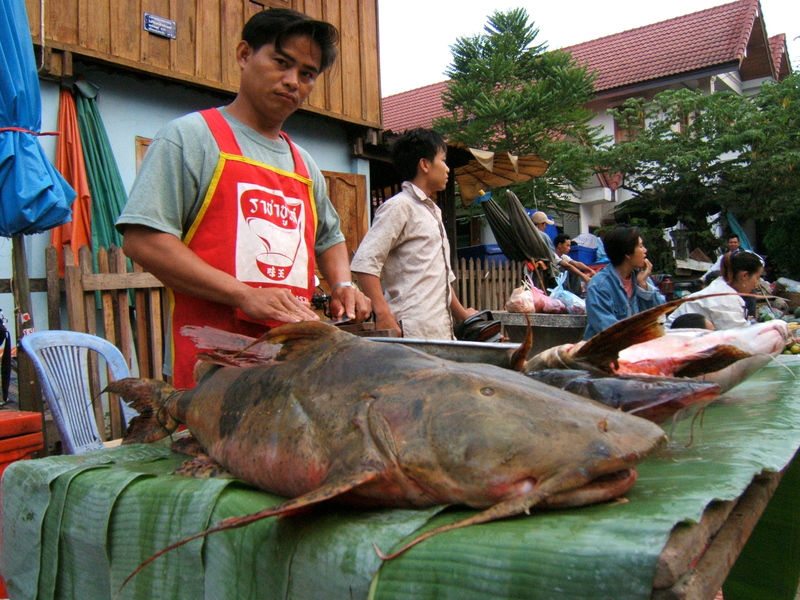 The forward included essays on Lao eating habits, culinary equipment and “unusual ingredients – illustrated and explained”. The recipes had intriguing titles, like ‘Deer prepared as a salad’, ‘Pickled fish roe cooked in banana leaf packets’, and ‘Sour wild chicken soup’. As I relayed my excitement to the ladies at ‘Books for Cooks’, they told me that the owner of Prospect Books was none other than the ex-ambassador to Laos, Alan Davidson. He’d started the publishing company when he retired from the diplomatic service in 1975 and was one of the world’s foremost authorities on food, particularly fish and fish cookery. He had just finished compiling ‘The Oxford Companion to Food’, an encyclopaedic work which came out in 1999 to great acclaim. So, that’s how I found myself knocking on Alan Davidson’s door in Chelsea. He had just arrived home from his office and greeted me, wearing a floral-patterned sun hat and carrying a bright orange patent-plastic shopping bag full of papers. A silver Buddhist medallion glinted at his neckline. Aged about seventy-five, with thick grey hair and a wicked expression, he reminded me of an absent professor. His appearance however, belied a mind like a bear-trap. As I got to know him over the coming months I noticed that he remembered every word I ever said to him. Sometimes he lost patience with my occasionally dreamy approach to life. We sat down to tea in his living room and in his distinctive cultured drawl, he began to tell me the extraordinary story behind the book. Alan looked at me conspiratorially from under his lashes. As he poured me some more tea and I noticed that he wore a watch on both wrists and his cuffs were shaggy with ‘good luck’ cotton strings tied on during the mysterious Lao ‘Baci’ ceremony. 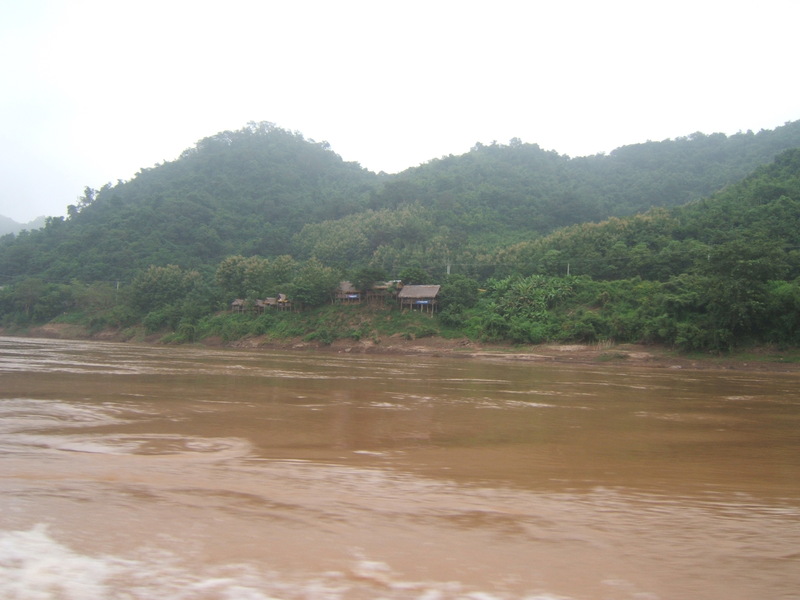 This chance encounter with the Prince and the notebooks became an act of preservation, soon after this conversation, the communist party – the ‘Pathet Lao’ took over the country, dissolved the monarchy and the original books were lost forever. 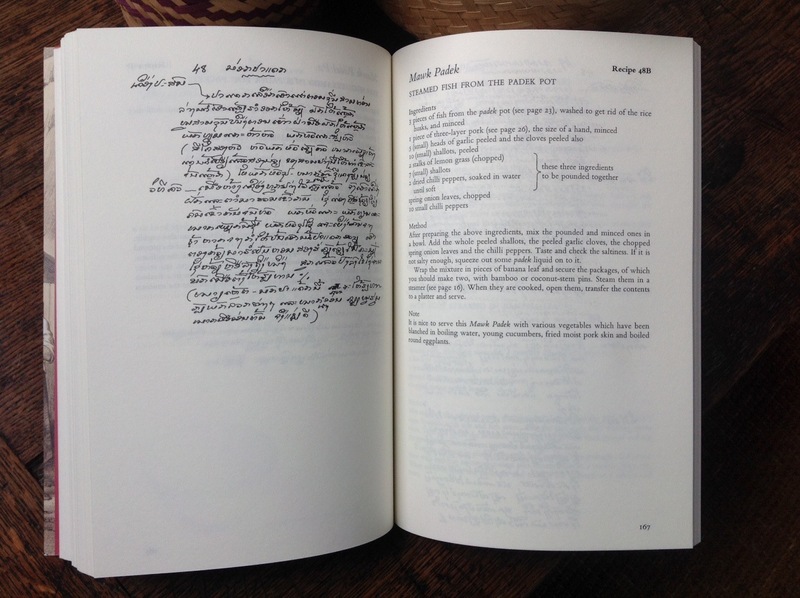 Alan Davidson published a translation of the notebooks in 1981, giving the proceeds to the Laotian political refugees fleeing from the country’s re-education camps, thus ensuring the only written record of royal Lao cuisine available at the time. 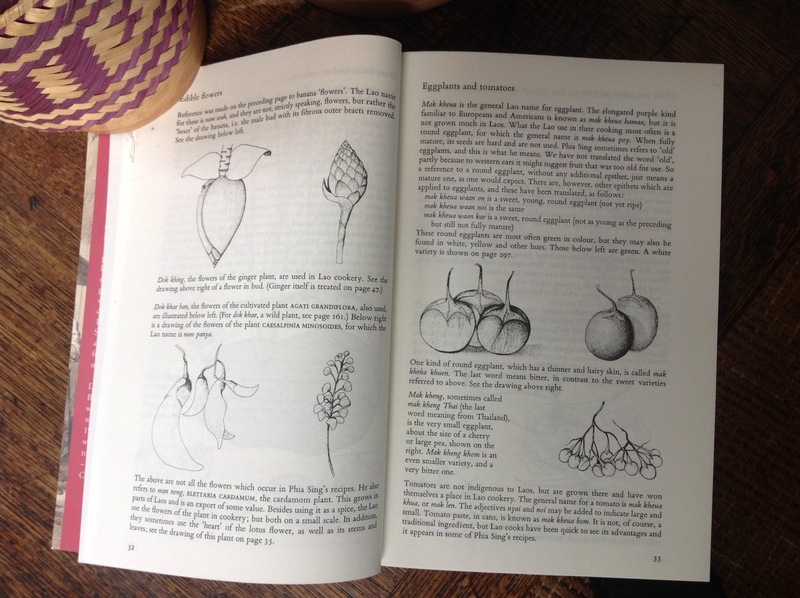 It includes descriptions of ingredients, methods of cooking and beautiful illustrations. I wanted to know more about Lao food and grilled Alan many times about what made it unique. He was extremely kind and helpful towards me but even though he has lived there, written a book of Lao fish species and edited Phia’s recipe book he would not be drawn into any detail unless I referred specifically to fish. Instead, he encouraged me to go and find out for myself. 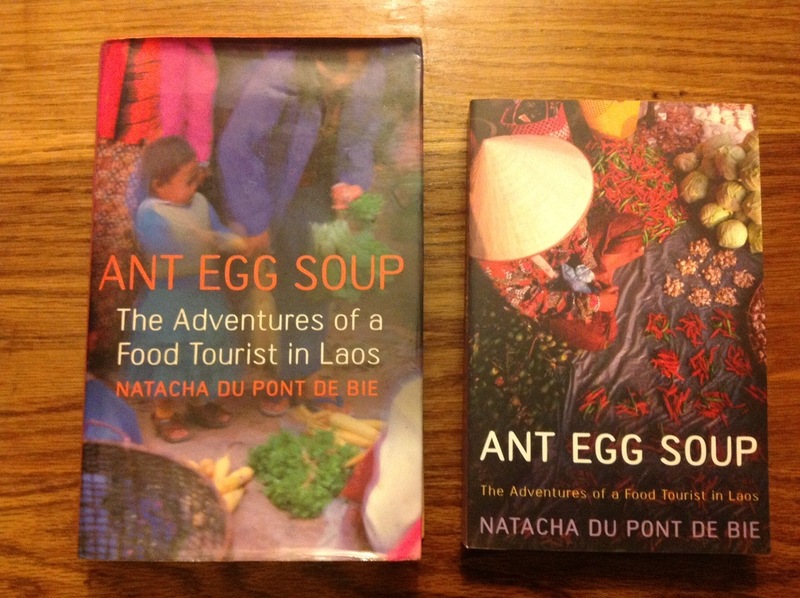 I did, and then wrote my own book about the adventure – Ant Egg Soup (which you can also buy, to make it a set!) I became friends with Alan who was one of the most interesting and entertaining people it has ever been my pleasure to meet. I also befriended Soun, who drew the exquisite illustrations that pepper the translation of Phia’s book and who taught me some delicious recipes of his own. Happy days. A note about a very special culinary publishing house. Prospect Books was founded by the late Alan Davidson and his wife Jane Davidson in 1979, at the same time as their journal of food history Petits Propos Culinaires. Since 1993, Prospect Books has been owned by Tom Jaine. Prospect Books continues to publish books only about cookery, food history and the ethnology of food. It is one of the very few British publishers to specialise in this field and produces four to eight books a year. Petits Propos Culinaires is published three times a year and contains articles, sometimes extracts from books or reprints, as well as reviews of current publications. 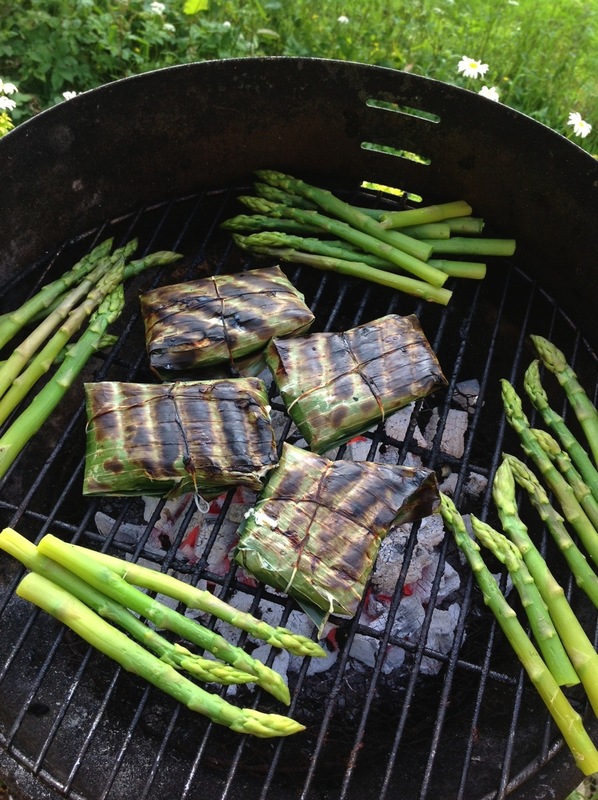 This is a fragrant treat for the barbeque on a Summer’s eve. 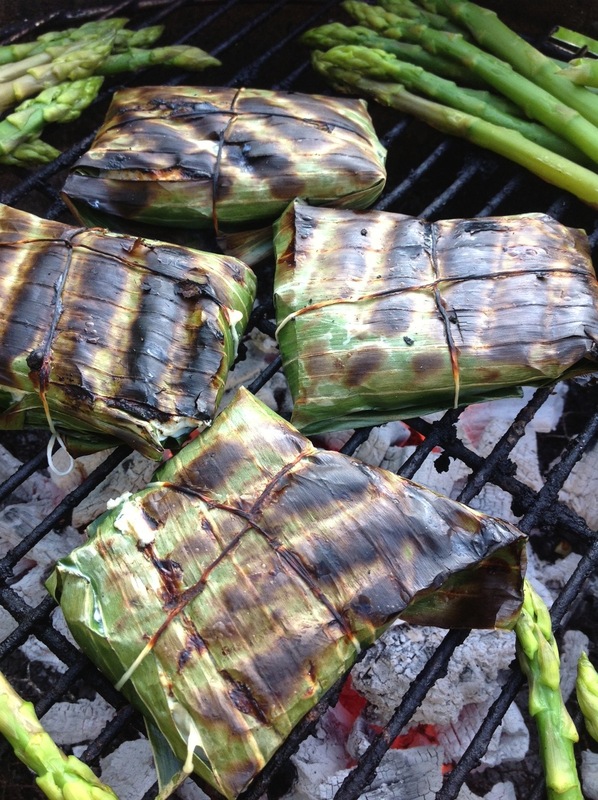 The chicken is pounded with aromatic herbs and wrapped in banana leaf, then barbequed The chicken steams in the banana leaf and the charcoal adds that faint hint of smokiness that is so frequently found in Lao cuisine. Yum. 1. 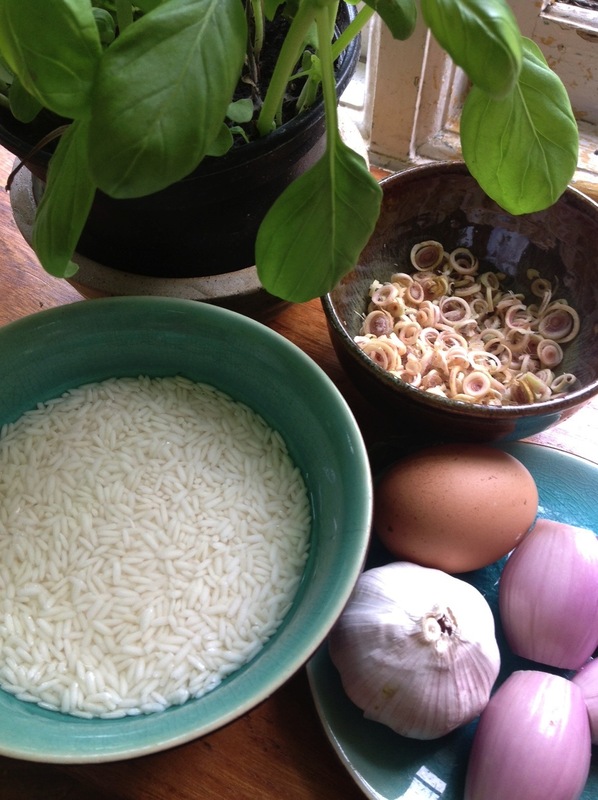 Soak the rice in warm water for half an hour or so, rinse three times and drain off the water. 2. Using either a food processor or more traditionally, a pestle and mortar blend or pound the soaked sticky rice, lemongrass, garlic, shallots and spring onions. 3. When the mixture becomes a rough paste, add the chicken and basil and pound/blend again to create a mousse-like texture. Then add the fish sauce and eggs and mix them in with a spoon. 4. Take you banana leaves and wash them. Blanche the banana leaves in boiling water from the kettle. 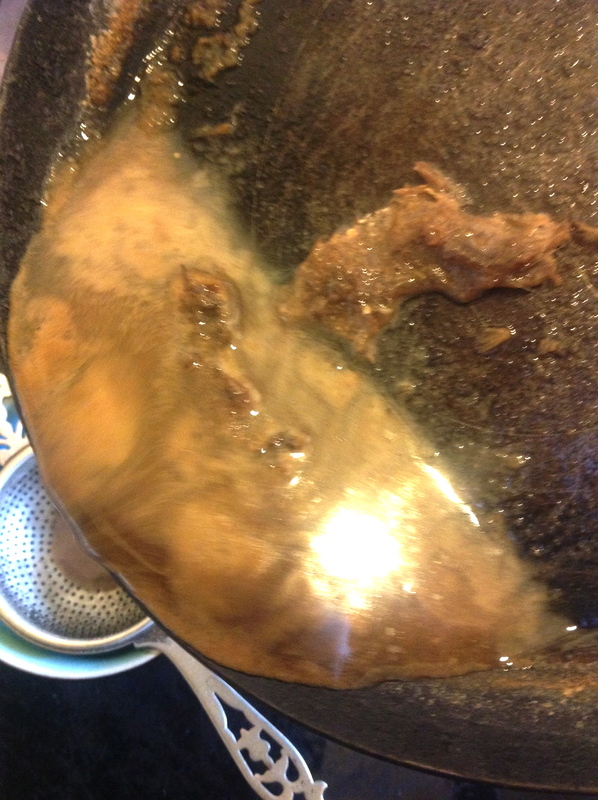 This cleans the leaves and also softens the fibres which helps prevent splitting when you wrap the chicken mixture. 5. Place a leaf on a chopping board and cut a square about 12cm (6”) wide. Cut away the hard stem, this will help when wrapping. Add a couple of heaped tablespoons of the chicken in the centre of the leaf. 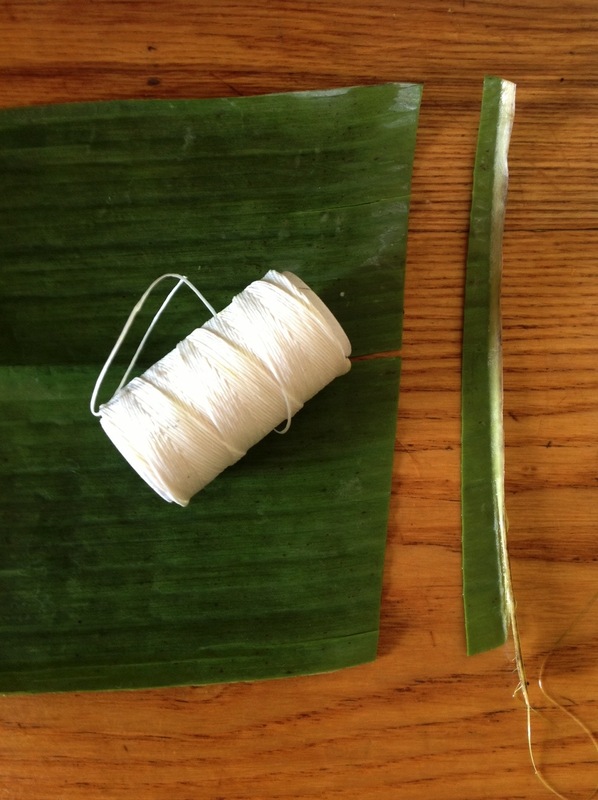 Fold the leaf into a packet and tie with kitchen twine. 6. Grill on a BBQ for 5 minutes or so turning half way through. Open one to check it is cooked through and replace on the BBQ for a few minutes more if needed. 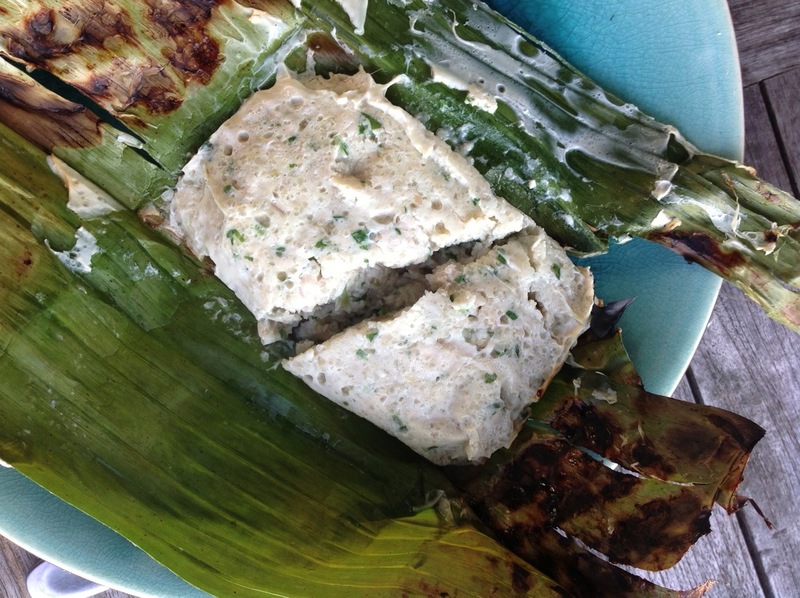 Serve with sticky rice, greens and jaew, and allow your guests to unwrap their own parcel on their plate like a gift. 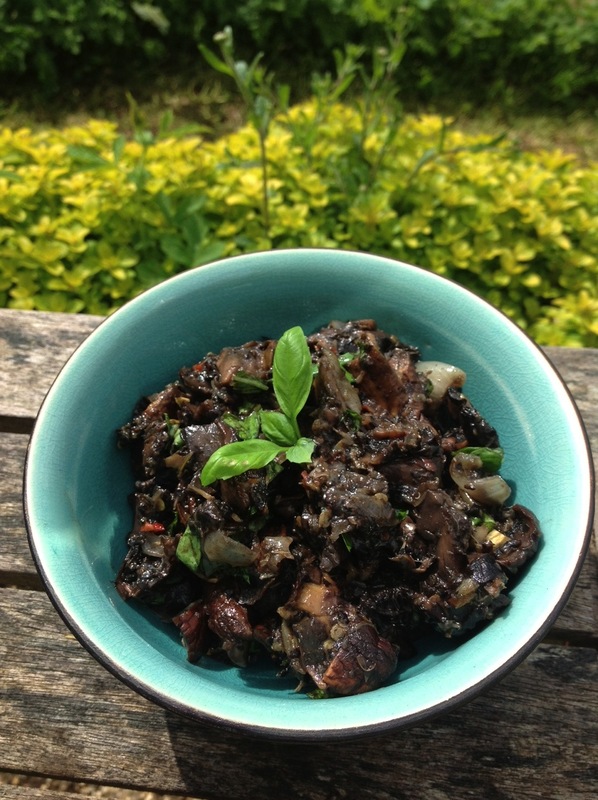 I’ve had mushrooms in my veg box for the fifth week running which put me in mind of a recipe taught to me by Seng Sone Darasavath, at the Darasavath guesthouse in the Northern Lao town of Luang Nam Tha. 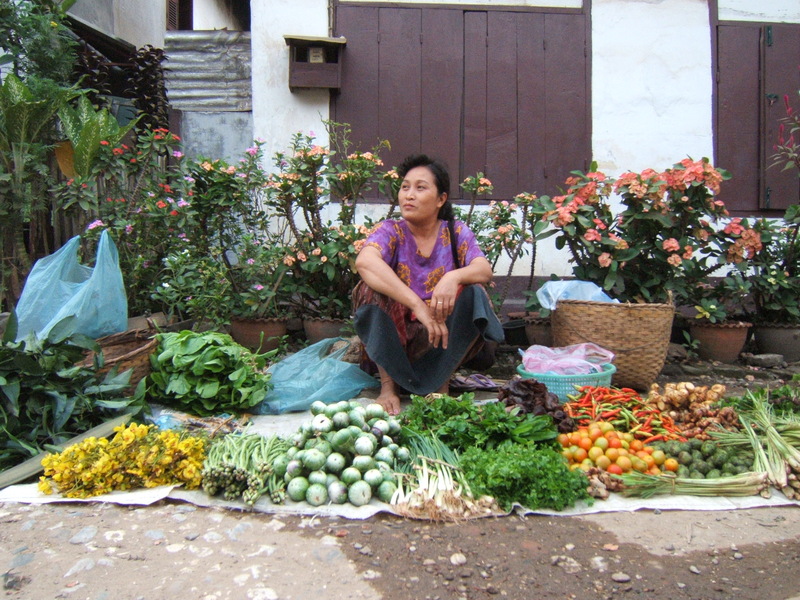 Seng Sone was an extrovert, thirty-year-old single mother who ran her own business in Laos with canny charm. She spoke English and Chinese and crocheted hats at great speed in between capably multi-tasking the business and looking after her excitable toddler, Micky. The evening I arrived, she took the time to sit down and introduce herself to me, whilst coping with twenty raucous communist party officials on a drunken night out, and offered to teach me to cook the meal I ate on my first night there – chicken and potato curry, served with a plate of steamed vegetables and two super hot jaew, one made with fermented shrimp paste and another with mushrooms. Jaew is pounded sauce or rough paste, the main ingredient of which is chilli. 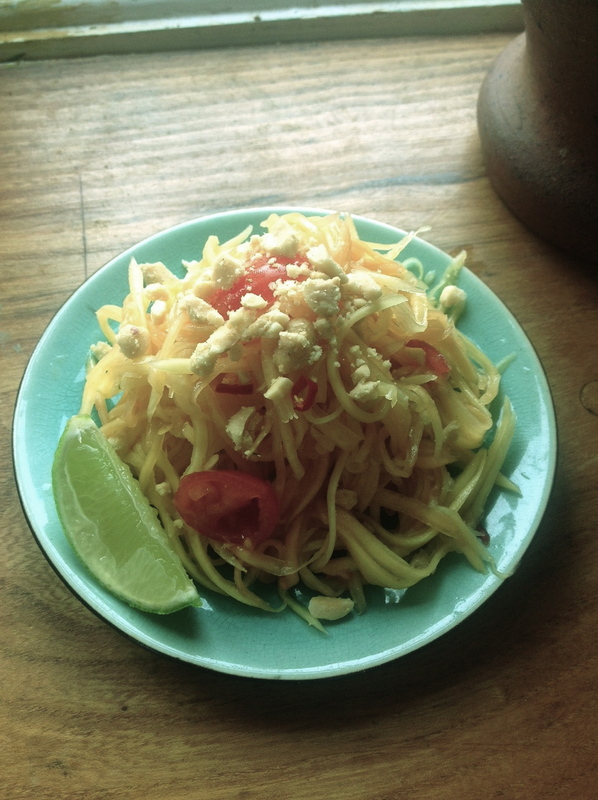 The varieties are endless, and you may wish to try my tomato jaew recipe on my blog link here. Seng Sone’s jaew was extremely hot; she used twenty bird’s eye chillies for one small bowl, though today I used four, as I didn’t want to my guests to detonate during our barbeque. Seng Sone had big plans to build another guesthouse and restaurant in the hills ten kilometres away near her family’s poppy fields, and I’m sure a woman of such determination is now the head of a mini-empire in the region. I still have a delicate crocheted hat she presented to me when I left the area and, of course, her recipes to share. 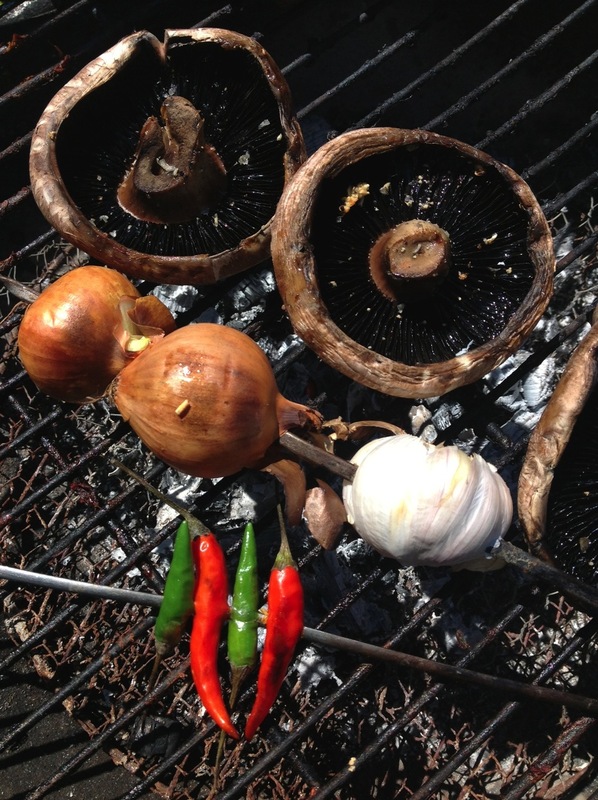 Baste the mushrooms with a little oil and grill until juicy. Set aside. Spear the chillies, garlic, and shallots on a skewer. Then sear them over an open flame (gas ring or even a candle if desperate) until well they begin to blacken. 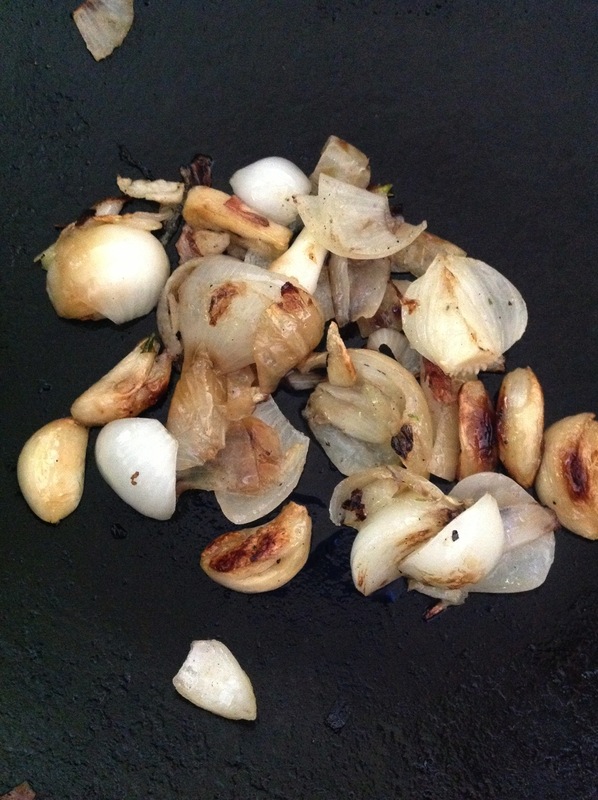 Rub off the worst of the soot and discard the onion and garlic skins. Roughly chop up the onion and garlic, leaving the chilli to one side. Transfer the vegetables to a wok with a little oil and stir fry for 2 minutes stirring constantly. 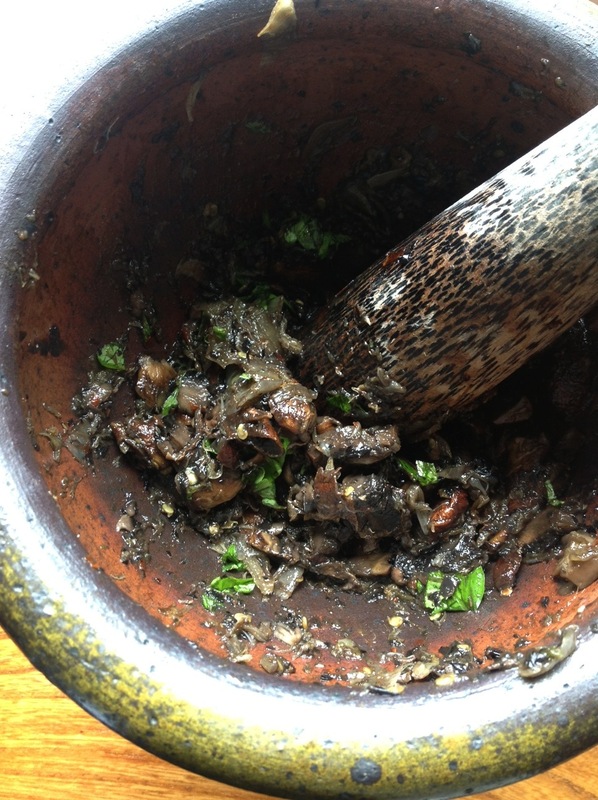 Transfer everything to a pestle and mortar in the order below and pound until they turn to rough paste. 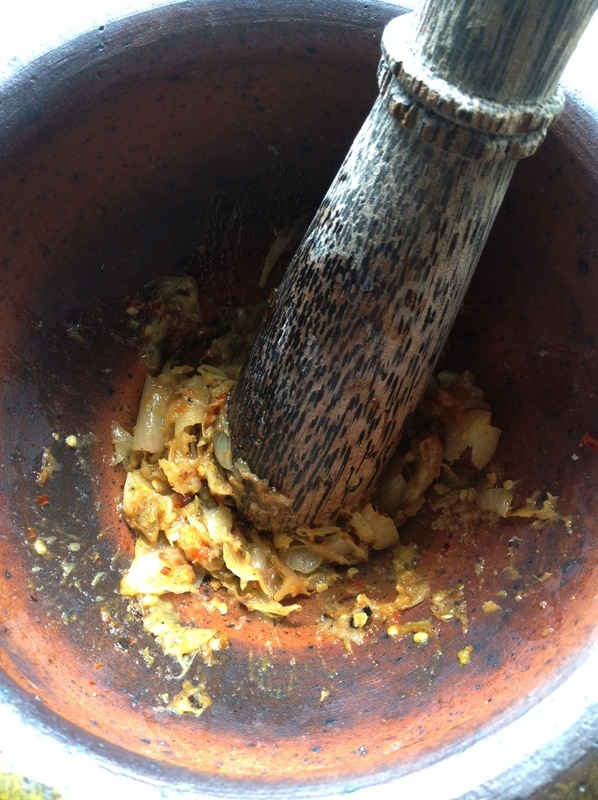 First pound the chillies and salt pound to a paste then add the garlic and paa dek (or fish sauce) and keep pounding. Next add the shallots and when they have reached paste form add the sliced grilled mushrooms and pound some more. You may need a spoon to scrape the mixture around as you pound it. I prefer the mushrooms to stay in larger lumps so I only pound for about ½ a minute. Add the basil leaves and pound some more. 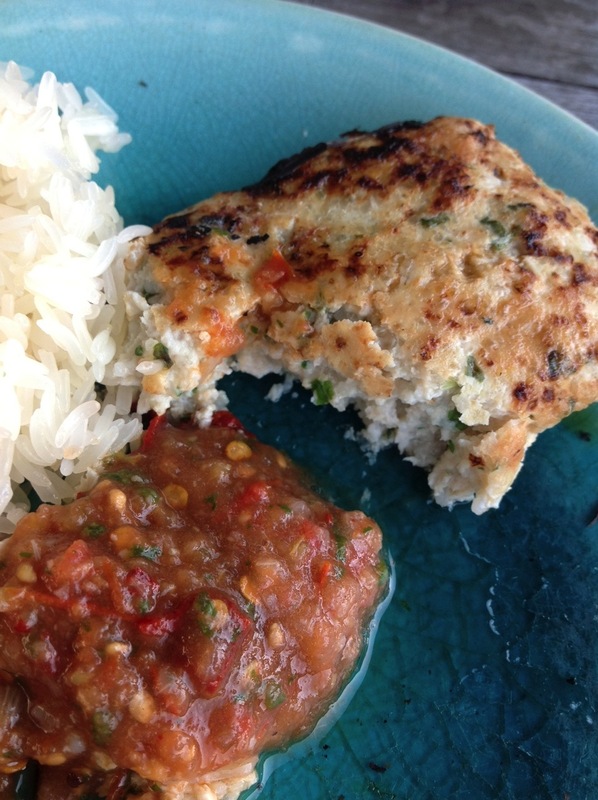 Serve with sticky rice. Paa-dek is a condiment of fish chunks mixed with brine, rice dust and rice husks. These ingredients are fermented in large pottery jars for up to a year to produce a salty fishy sauce with a pungent aroma. This may sound a little off putting (remember, we eat fermented mouldy milk) but the taste is very similar to preserved anchovy fillets. 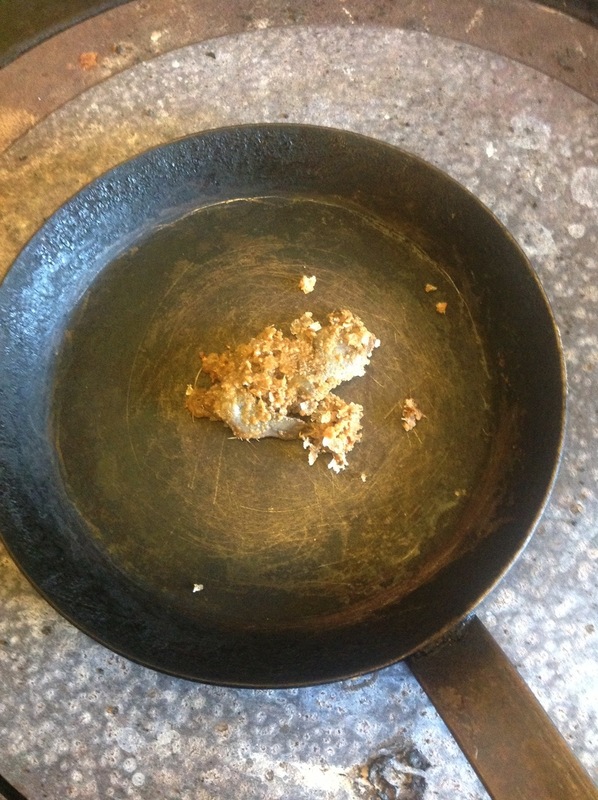 The mixture may be used straight; or the fish chunks are washed of their rice husks and used alone; or the liquid is used without the fish chunks. I often saw people pour a ladle into a wok with another ladle of water, then hard boil it for a minute, sieve the result and use the flavoured water. You can buy Thai and Philippino versions of paa-dek in jars which will give you the closest similar flavour . I have also found a good alternative in a thick muddy brown bottled anchovy sauce available in most Asian supermarkets, which you can just splash in to give a near-as- damn-it authentic flavour with the added bonus that it is easier to handle. Or use English bottled versions made with anchovies and salt (NOT vinegar). 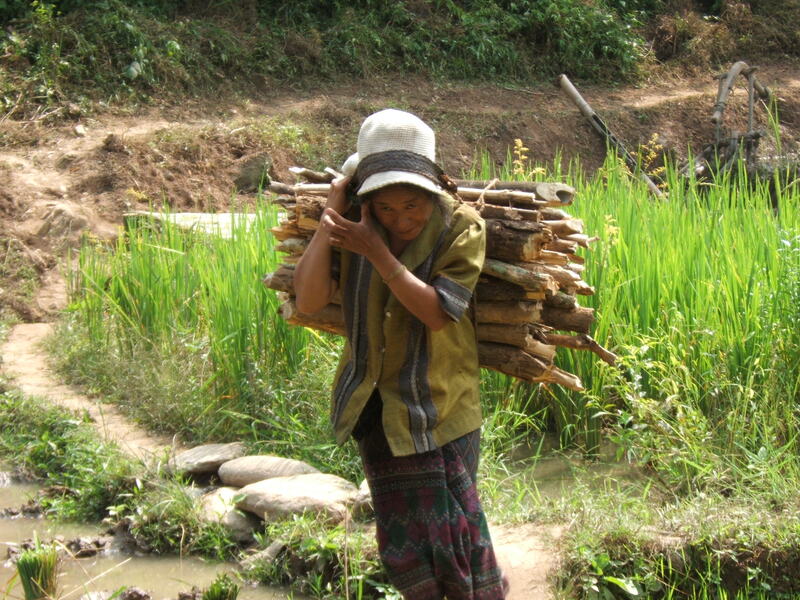 With neither available you can make your own, like many British Laotians do in an emergency. Place 400ml of fish stock (or half a stock cube with 1/2 litre of water) in a small saucepan with ten tinned anchovy fillets (in oil). Bring to the boil and simmer for a few minutes until the anchovies have almost dissolved. Sieve out the lumps and boil vigorously for another few minutes to produce a salty, muddy brown liquid. Yum. 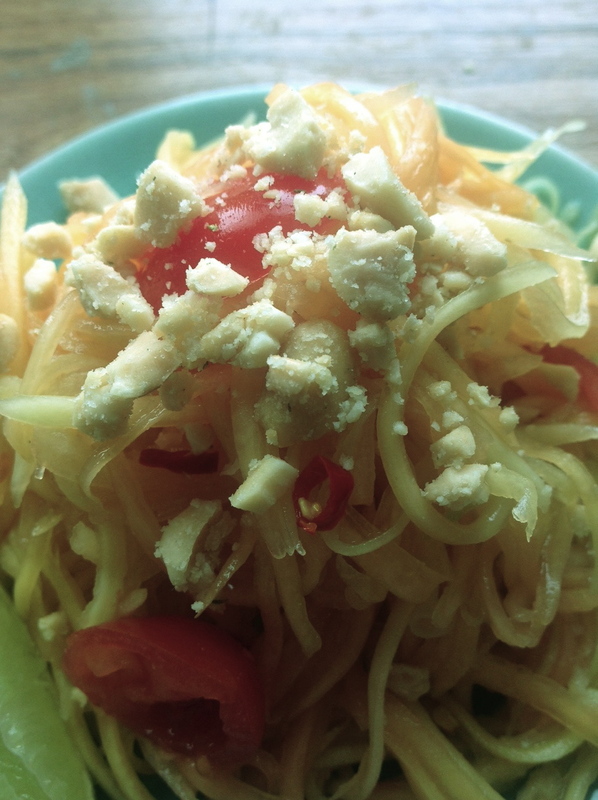 Papaya salad in Laos and is always made with paa-dek. It is also a dish of huge popularity in Thailand, particularly in the Northeast, where it has many incarnations, according to the preference of the chef. It can be made with fish sauce instead of paa-dek or shrimp paste and sometimes with added ingredients such as dried prawns, crab, tamarind, chopped green beans and often, sugar. 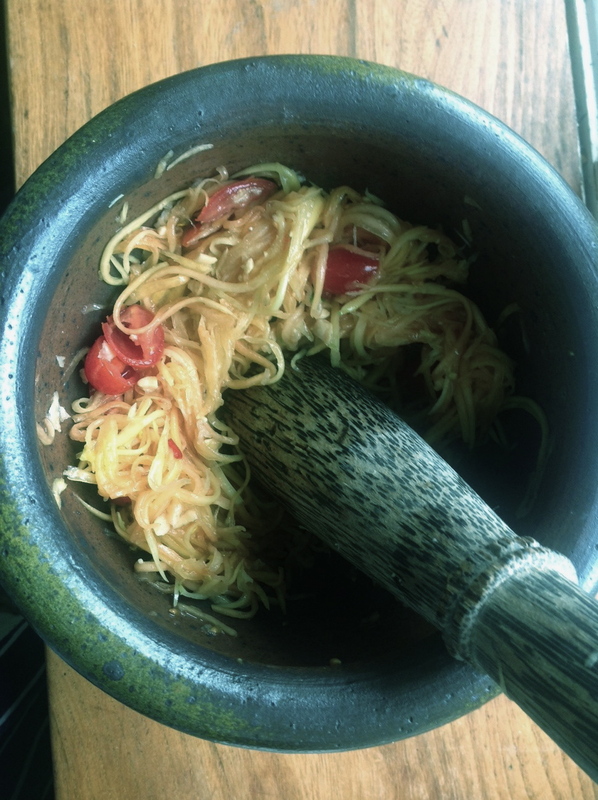 In Laos, I found it tended to be made simply, with unripe green papaya, lime, paa-dek (see directions at the end of the recipe) and no sugar, but it is a recipe that is constantly evolving. In Vientiane, a sour fruit, Mak Kaw (hog plum, a small orange fruit sometimes available in Asian stores) was a popular addition. The dish should be juicy and taste hot, sour, salty, sweet and garlicy with a hint of the piscine. It is very refreshing with a Lao Beer. 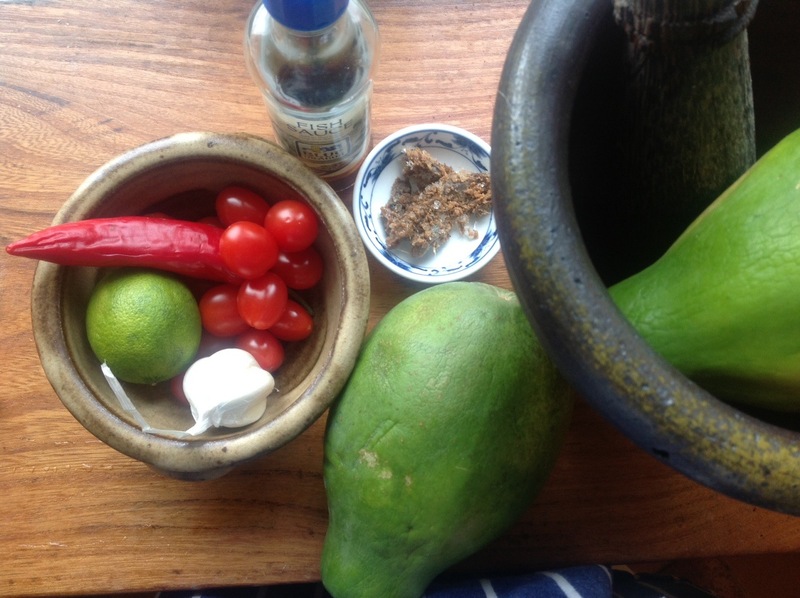 Living in the middle of the Dartmoor wilderness, green papayas are hard to find, these were a little on the pink side but hard and sour enough for this dish. Hog fruit? Impossible to find sadly. 1/2 lime, cut into 8ths, leave the rind on. 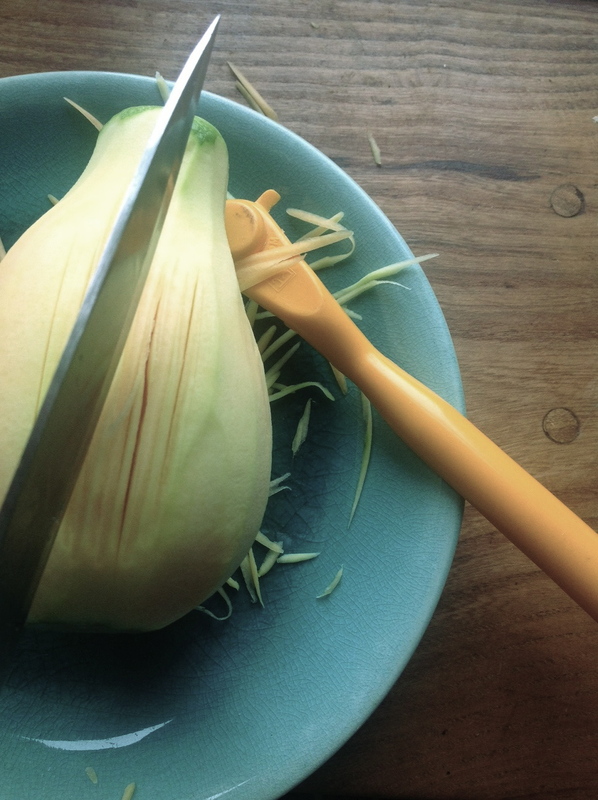 Take a green unripe papaya and peel it with a vegetable peeler. To do this, place a dishcloth in one hand so the fruit does not slip and place the papaya on top of it in your palm. 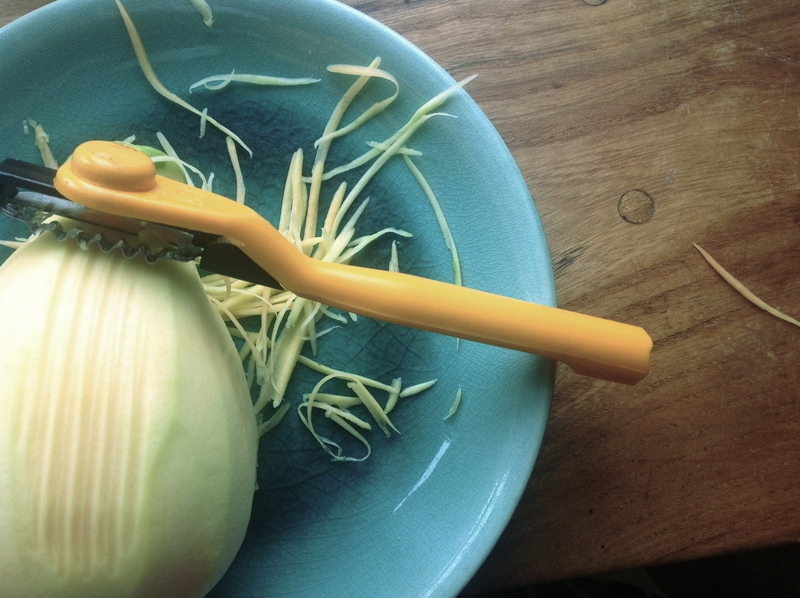 With the other hand use a cleaver or heavy chopping knife to chop at the flesh leaving many roughly parallel cuts. Then cut under the slices from the chopped surface and you will end up with fine shreds. Alternatively, you can use a mandoline or buy a special shredding tool at oriental stores, as I have here. Now take a pestle and mortar. Add the chilli, garlic and a pinch of salt and pound roughly (about 20 pounds) so the chilli is still in quite large pieces, not a paste. Then add the papaya and pound gently using a spoon to turn the ingredients in on themselves. Add the lime juice and paa-dek (instructions below) or fish sauce. Pound gently, a little more and then add the tomato and the Mak Kaw fruit. The tomato should just be bruised. Pound again and serve with lime wedges. You can add more lime or fish sauce to taste. I like to add a topping of salted peanuts too. 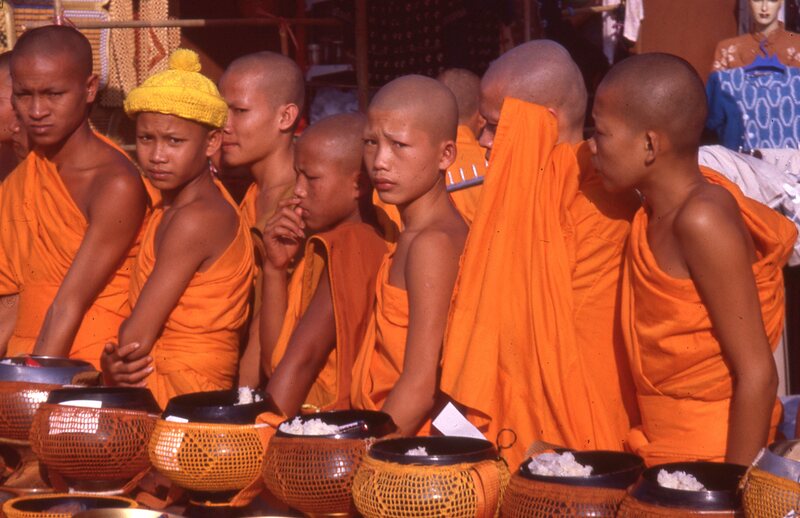 Look up the English turnip version I was shown by my friend Soun in London in my book – Ant Egg Soup The Adventures of a Food Tourist in Laos – now out of print but available from me if you wish to buy a signed copy. 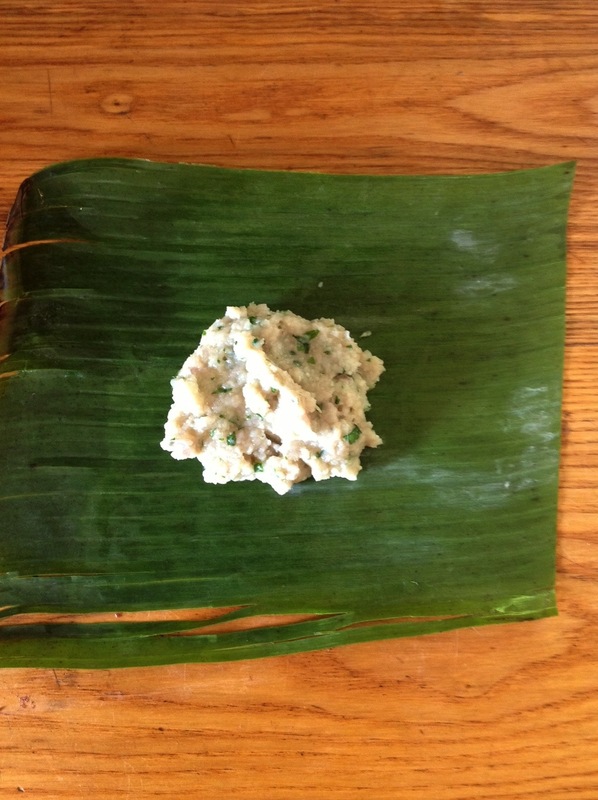 Paa-dek is a condiment of fish chunks mixed with brine, rice dust and rice husks. These ingredients are fermented in large pottery jars for up to a year to produce a salty fishy sauce with a pungent aroma. This may sound a little off putting (remember, Westerners eat fermented mouldy milk in the form of cheese!) but the taste is very similar to preserved anchovy fillets. 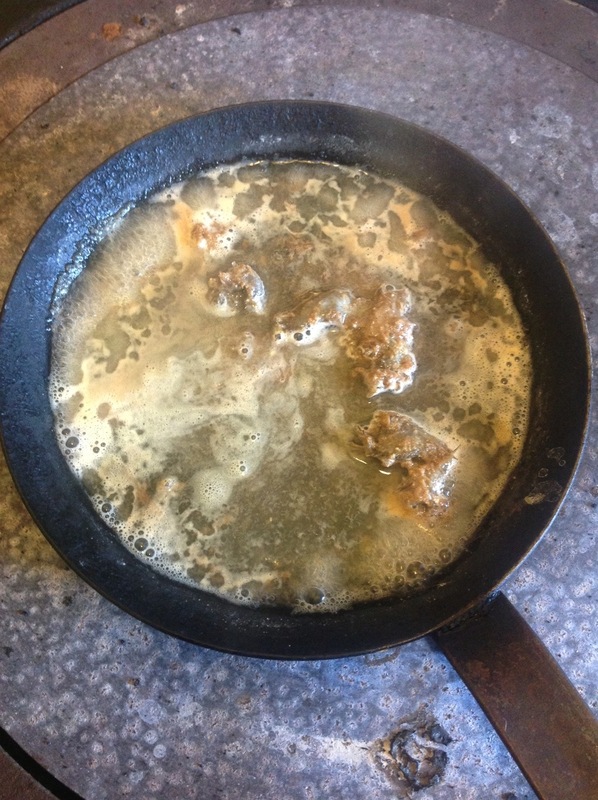 The mixture may be used straight; or the fish chunks are washed of their rice husks and used alone; or the liquid is used without the fish chunks. I often observed people pouring a ladle into a wok with another ladle of water, then watched them hard boil it for a minute, sieve the result and use the flavoured water. Here I have done the same, using a mini frying pan. Heat the pan until it is hot. 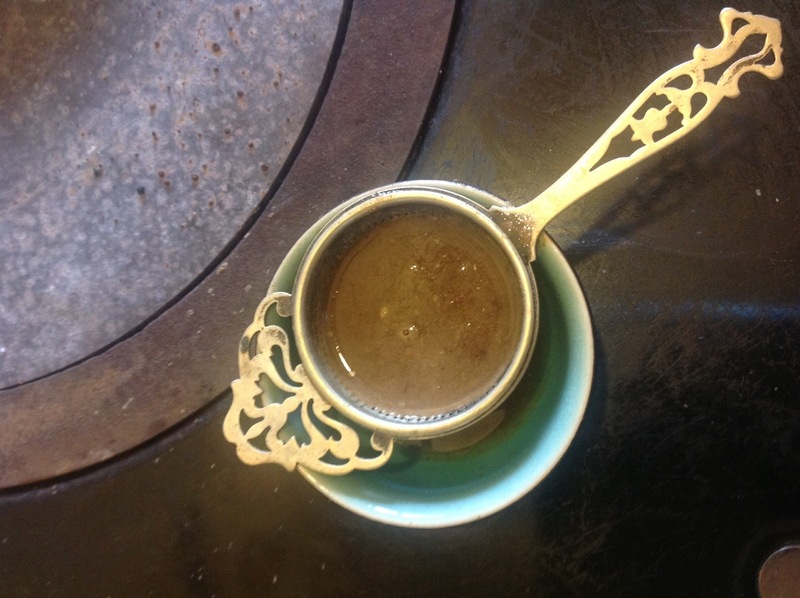 Add ½ cup water, it will boil immediately, cook for about a minute (add a little more water if it looks too dry). Seive into a bowl. Here I used a tea strainer and the result made about 2 tablespoons of Paa-dek water for my salad.